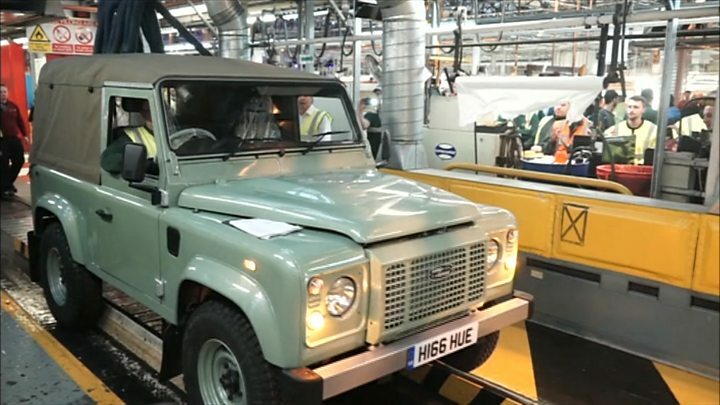 The last Land Rover Defender has rolled off the production line amid cheers, ending 67 years of the 4x4 being made. Plans to bring in stricter measures for new car emissions by 2020 meant there were "certain conditions the Defender just won't meet", the company said. A "big turnout" of "cheering workers and media everywhere" accompanied the completion of the last Defender at about 10:00 GMT, said BBC Midlands Today's transport correspondent Peter Plisner. "It's the death of an icon," said Simon Collins, Warwickshire and West Midlands Land Rover Club secretary. There were cheers and sadness this morning as we witnessed the last Defender roll off the production line after almost 70 years; the longest-running production car in the world. We heard about a family in which three generations had worked on the Defender and the Series of models before it. Some workers also chose today to retire rather than transfer to other parts of the plant. All 700 employees who worked on the Defender were invited to a farewell event to the iconic model. Land Rover also brought in some of the vehicles from the past. It was quite a send-off. Motoring journalist Quentin Willson said the Defender would live on. "With some 70% of Land Rovers ever built still around we will still be able to cuddle them and see them on the road. And while we can shed a tear, there are still lots and lots of Land Rovers," he said. A replacement model for the Defender is being developed, said the manufacturer.